With the arrival of a good South Westerly blow, that everyone has been waiting for, it was all about the Cod over the weekend. However as has been so typical recently the weather didn’t really play ball, which made fishing conditions tough to say the least. It really was about location, timing and perseverance, especially on Saturday night. Those that knew the window of opportunity would open late Saturday evening and got themselves into place, did reasonably well, especially the ones that headed to Abbotsbury. Even so it was not exactly a Cod fest and a lot of anglers went home empty handed. Showing once again how difficult it can be to fish Chesil. 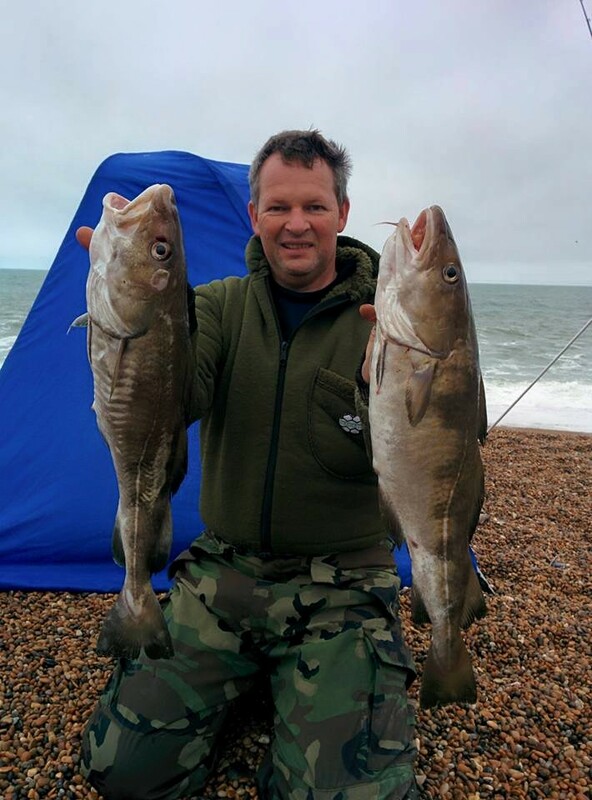 Simon Lancastle got it spot on and managed a few nice Cod up to 7lb. He tells me that he didn’t have any problems of being buried under the shingle that we were suffering at the Ferrybridge end. The steeper shelving beach towards Portland meant we were not able to get as close to the water to get the distance we needed and there was quite a lot of weed on Sunday morning. This resulted in tackle loses for many, including myself. 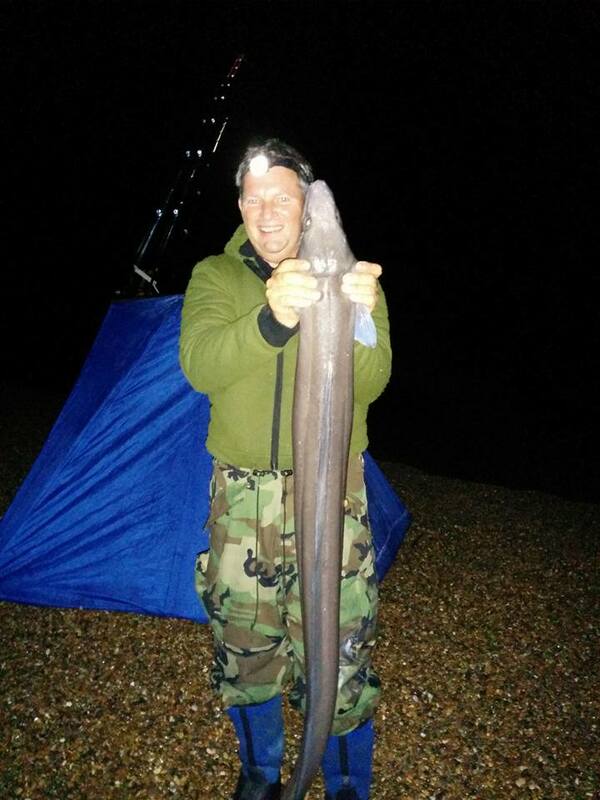 Simon also managed a personal best Conger Eel of 21lb. One of several good eels that have been landed by anglers on Chesil recently. 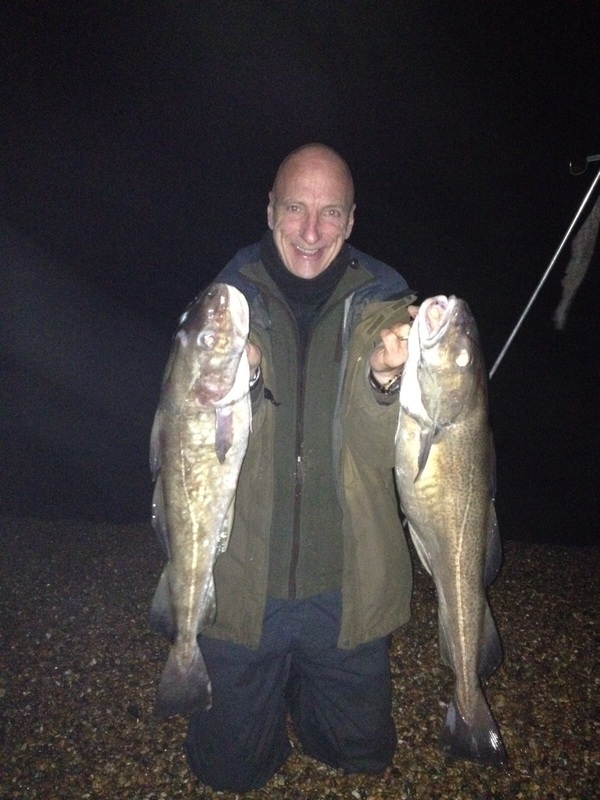 Bradley Price, who was amongst the Cod last week also ventured to Abbotsbury with his mate on Saturday night. They ended up with 6 Cod. 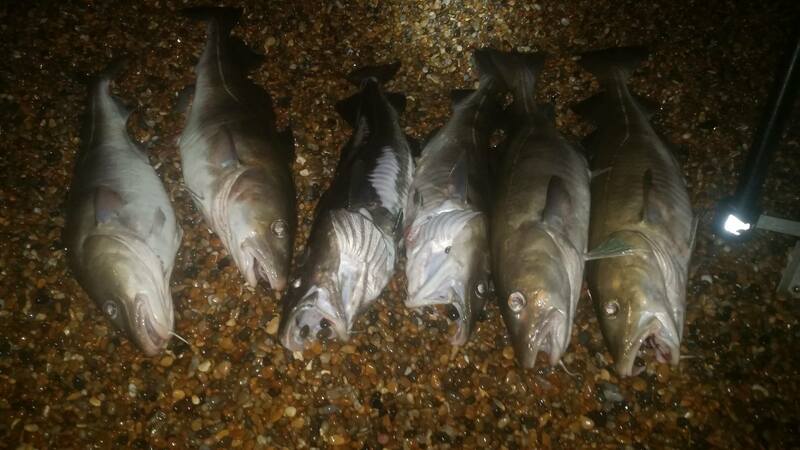 Despite having spent a load of money of Lugworm, all Bradley’s Cod were caught on whole Squid. Squid combined with Lug worked well for Ian Clarke, another angler that made the right decision to head to Abbotsbury. He was rewarded with a lovely brace weighing 6lband 8lb. Looking at the week ahead, there are one or two short gaps in the wind that look like they may produce similar results to the weekend. I for one have taken onboard the knowledge that in those short windows, I will need to head to the shallower shelving end of Chesil to make the most of those precious opportunities. I know I promised you a couple of articles last week. Unfortunately I was not able to get them out. I can say that this week we have a lot more including a Poole area report from Leo, and a great article on Luminescent lures from Allan Yates. Portland: Rough on the West side and a large swell on the east with coloured water. Chesil Beach forecast: The beach will be unfishable for the majority of the week, with the possible exception of Wednesday and Thursday morning. Even then you will need to be a good caster to get out past the surf, which will be bigger than it was at the weekend. The good news is that the water will be even more disturbed, drawing in fish from further away. It will be a lot more coloured as well. The Usual big baits of Squid, Lug worm and if you can get it Peeler Crab. Portland: The Bill and all of the West side will remain pretty much unfishable all week. However the large swell will disturb the beach at Church Ope Cove. This may offer some good sheltered fishing, with the chance of Bass, Pollock and Wrasse. Portland Harbour: The tides are starting to build and I love to fish the harbour this month with lures. The water temperature remains fairly high for November, so we could well see a period of 3 or 4 weeks, where the Bass fishing could be very good. I have had most of my larger Bass from the harbour during November. This is where I will be most of this week. 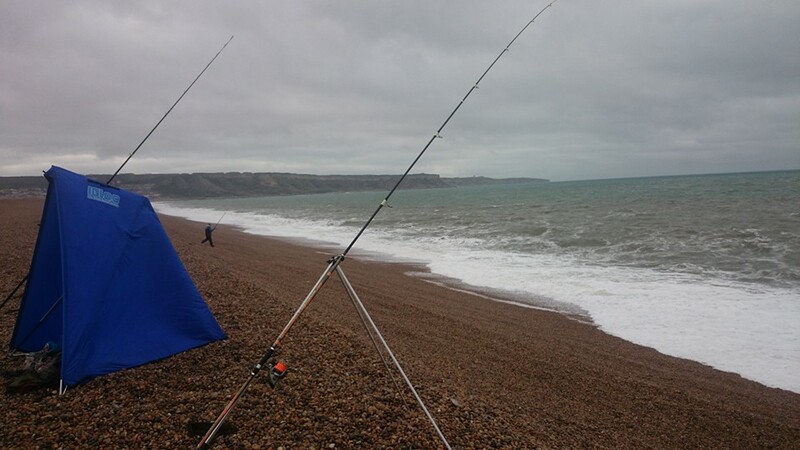 For those that do turn up to fish Chesil only to find it unfishable, then drop over the back and try for Flounder and Bass with bait at Hamm Beach or Sandsfoot Castle. Weymouth Bay: The water is most likely going to be too coloured for Squid fishing from the pier. However there are plenty of species still around. Both piers will be reasonably sheltered from the wind. Wrasse, Pout, Pollock, Garfish and even Bream will be around for a few more weeks at least. Preston Beach will be good for Dabs, Flounder and the odd Bass. 4 Responses to "Tough Going"
I always look forward to your reports, and have learned an awful lot about the area,which tactics to adopt and when. One thing that I am a bit unsure of at the moment, is which type of lure to use in the harbour this time of year ? I have had a reasonable amount of success chopping and changing from hard to soft lures during the summer, but wondered if there may be a specific approach this time of year ? As I will only have a couple of opportunities to finish the lure fishing season this year, any advice would be greatly appreciated. I almost exclusively use surface lures in the harbour. Patchinko. Gunfish and Seaspin Pro-Q work really well for me, but I like to use them in a number of different ways depending on wind and tide. I have had some success with sub surface lures, but nothing beats the excitement of seeing a Bass smash into a surface lure. Many thanks for the reply Sean. My other half has now got the fishing bug and she swears by the PRO Q 90 ! I know what you mean about the excitement of surface lure fishing, even after dark.We will have a few more sessions in the harbour and then hang our rods up for what will seem like an eternity until next spring. We will still be following your reports and I shall be trying for a few squid and cod. Thanks for the fantastic tips and info you give on fishingtails.Im hoping to get down to Chesil early this Thursday morning as it looks as if the wind will drop for a while but after reading your latest article about it being a bit difficult to fish the portland end of chesil saturday night because of lines getting buried i was wondering if you could advise me if Abbotsbury or the Ferrybridge section would be better to try for cod.